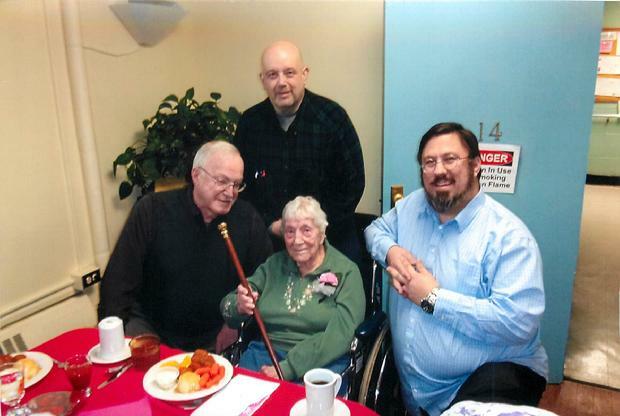 and 5032 VT RTE 114 in Canaan, VT.
Jane Stevens receives Boston Cane from Canaan Selectboard (l to r) Greg Noyes, Haven Haynes, Jr. Frank Sawicki Jr. The Canaan Selectboard would like to remind town residents that, despite the best efforts of the town road crew not to do so, sometimes items within the town highway right-of-way get damaged, either by snow removal or other highway maintenance equipment. The town is not responsible for damages obtained within this 25 foot from center of road. The Selectboard is asking that residents beware before leaving or placing objects such as vehicles, fences, trees, signs, etc. within these boundaries. Objects may be removed at the owner's expense. No person, other than an employee in the performance of his or her offical duties as authorized by the agency of transportation or the Selectboard, shall plow or otherwise deposit snow onto the traveled way, shoulder or sidewalk of a State Highway or a class 1, 2 or 3 Town Highway. The Town of Canaan is a picturesque community located on the Connecticut River in Northeastern Vermont. It is bordered by New Hampshire and Quebec and many consider it to be the "real" Northeast Kingdom of Vermont. Canaan is a great place to live, work and visit. Its current population of 972 is primarily employed in the tourist and logging industries. During its 225 year history, Canaan has provided its inhabitants with superb water and sewer service, roads, schools, libraries and recreational and cultural activities. People in Canaan take pride in their independent nature and "can do" attitude. The myriad of activities (moose festival, softball tournaments, sugar on snow social, fall festival, art in the park exhibit, historical society, parades, variety shows, dances, American Legion functions, church suppers, etc.) conducted by members of the community demonstrate that given a task they will successfully carry it out with a high degree of confidence and professionalism.